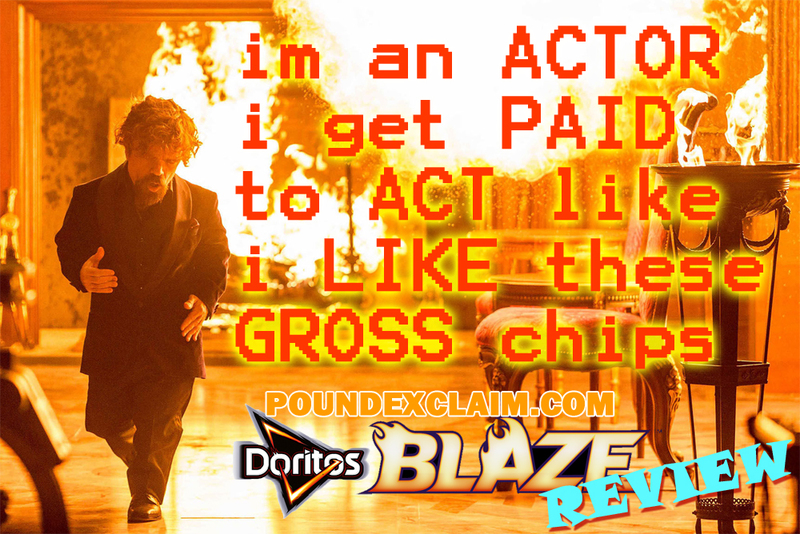 We are quickly approaching the date 4/20 (blaze it) so I thought it would be the perfect time to review Doritos Blaze. It's a flavor of corn chip created by the Frito Lay Corporation. You're perhaps familiar with the standard Doritos flavors: "Nacho Cheese" (the default/original flavor) and "Cool Ranch" (also known as "Cool American" in non-American countries). Blaze is relatively new and somewhat scarce in many chips aisles--two reasons why I had to try it. The truth is, though, I've been working on the same bag of Doritos Blaze corn chips since the US American Football Super Bowl Tournament. At this point that's about two months of Blaze. And it hasn't taken me so long to eat these chips because I'm a bit of a health nut. Because I've totally crushed entire bags of other styles and flavors of chips and snacks in the interim. I've been savoring these DBlazes for so long because (review preview: I don't like them). I don't want to finish the bag even though it's primarily crumbs at this point. And I don't want to waste food. Can I mail a mostly eaten bag of chips to starving children someplace? Will local ducks eat DBlaze? It's purple: I love it! Look, there's flames and smoke. U kno it's hottt fam. Is Doritos trying to capture the Hot Cheetos and Takis market? So based on packaging and the name I might assume these are hot chips. Have I done this before? This all feels very familiar like I have already reviewed DBlaze at some point in the past 2 months. Maybe it's just the same unpublished draft that I've been sculpting in my brain. I could check, but who has time for that. Besides: fresh content. FT makes the world go round and I am here to sling 'tent. I don't have a picture. I took the crumb bag to work hoping that I could trick a co-worker into eating my leftovers or that I might get snackish enough during a brain storm to finish the bag (so far no good). They basically appear similar to standard NachoCheeseD's but are more red because of the red blaze powder. These will ruin a shirt or pants or sofa arm if you wipe before licking or using a napkin or whatever. If you use a napkin to wipe your mouth after eating some you might think your lips are bleeding. These leave a very red stain. 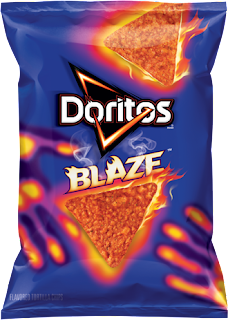 Doritos Blaze aren't good. Part of what makes Doritos so good is their iconic flavor profile. When they get adventurous with flavors it may as well be a dollar store chip. Though, the light texture and crunch are still signature Dorito, the flavor is just nothing special (or ingrained into my psyche from a lifetime of advertising). Hey speaking of crunch, whatever happened to Doritos for girls? So how hot are they? Not that hot, but also pretty hot. They are hot enough to provide a not-enjoyable eating experience. And it's not a good hot like I'm having a delicious spicy burrito or buffalo wings. They're hot in the way that doesn't provide dimension and just sneaks up on you after eating a bunch. The hotness doesn't add flavor. It's like they isolated the hot part of a pepper and turned it into a flavorless powder and then added fake pepper chemical powder flavor back into it and put it onto the chip. Eating hot foods should be fun. Eating Doritos Blaze corn chips is not fun. And, uh, you also, uh, regret it later, if uh, you know what I mean. Hint: digestive system. Who are these for? Middle&High school boys? Stoners? Bloggers who automatically buy new flavors of things just to review them? That's actually probably a demographic that companies target now. Hmm, interesting. I think these are for No One. It was an idea that had enough legs to leave the ideas room and hit the shelves. I certainly won't be purchasing another bag of Blaze. And if I wouldn't do it, who would? Do not recommend. Although, in retrospect, maybe if paired with an Ice Flavor Mountain Dew or whatever that Peter Dinklage / Morgan Freeman commercial was, these really come to life.